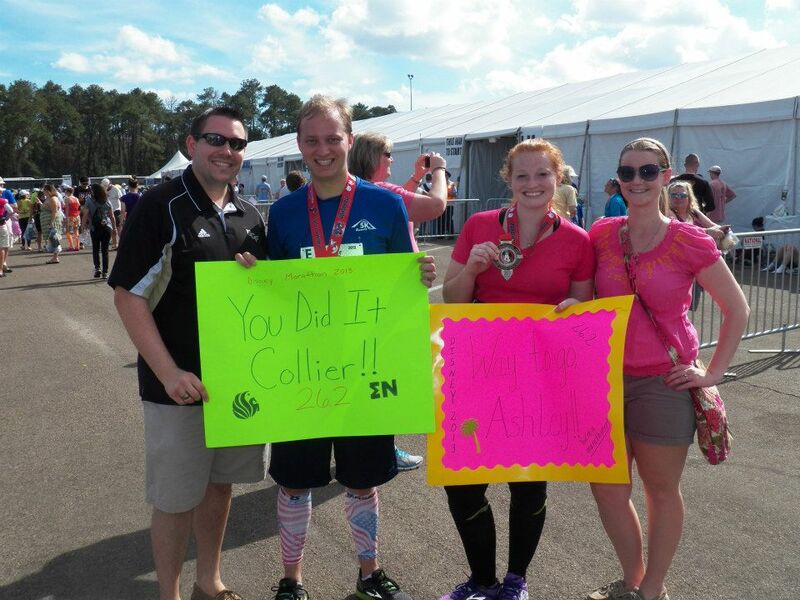 26.2 = We did it! 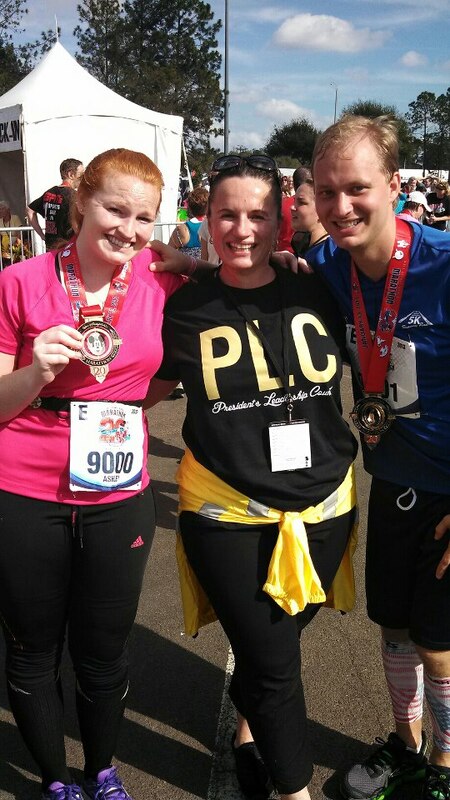 On January 13th, my husband and I completed 26.2 miles! It was the hardest thing I have ever worked for, and it made crossing the finish line that much sweeter! It was hard and tiring, and VERY hot. Being a Floridian for 23 years of my life, I definitely was able to survive. HOWEVER, I have never ran in weather hotter than 63 degrees here in SC, so it was a rude wake-up call. (Remember, I never ran outside in Florida….just danced, inside). We woke up super early, I believe at 2:40am. We wanted to make sure to catch the bus from the hotel to the starting area around 3am! I ate a bagel with peanut butter and a banana. 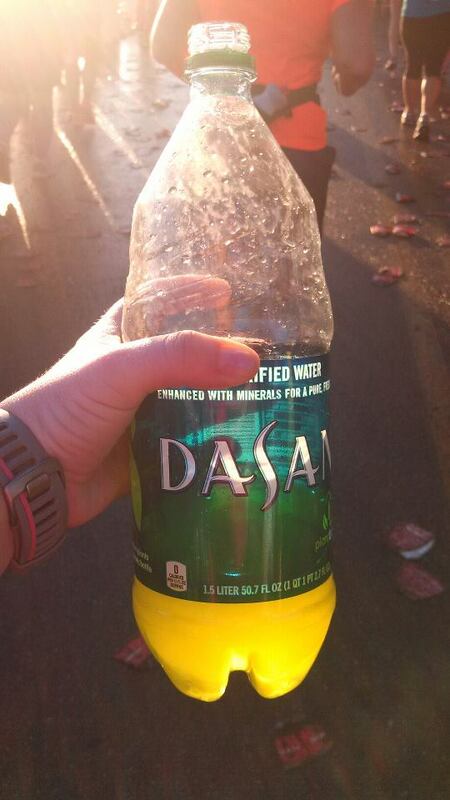 I also brought Gatorade with me, to help hydrate me for the sunny day ahead. We had been hydrating since Friday morning, because of all of the heat warnings. I also knew exactly how I could tell if I was hydrating correctly, thanks to my good friend Mary. We then had about an hour or so to wait until the race began! The good thing about Disney races, is that you constantly have interviews and entertainment getting you pumped up. Of course, when Joey came on the screen I jumped up! Before we knew it, they started releasing corrals. We were in Corral E, and it was the perfect spot for us! Right in the middle! I knew from the beginning of training, my husband mentally would do great with this race. He can be so determined and can focus really well. After the race, I found out he stayed right on pace at a 12 minute mile! But here is the kicker…..he never ran any short runs throughout training. Only the long weekend runs. He works about 70 hours each week, so he simply did not have time. (I definitely don’t suggest this at all. But it worked for him.) We had also decided ahead of time that he would run ahead of me, if he got hurt or something happened, he would fall back and find me. 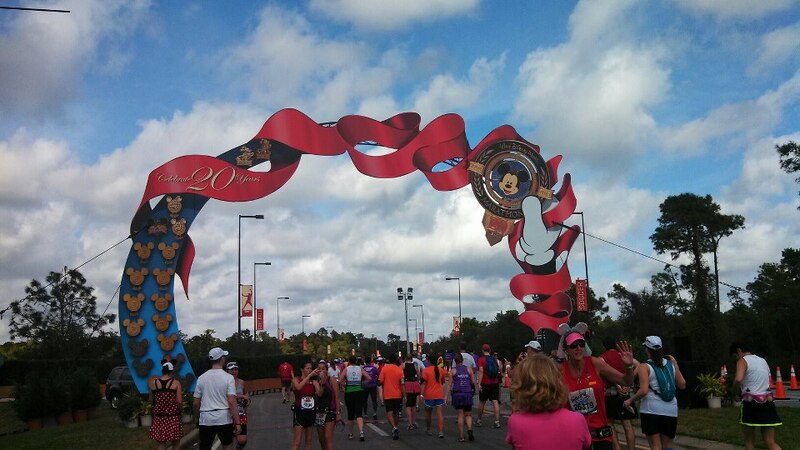 Throughout the race we went through all 4 parks, ESPN Wide World of Sports, Disney’s Boardwalk and the speedway. Around mile 6.5, I ran into Mary and Marcus cheering for all of the runners! (Mary is the person who beleived in my from the start. 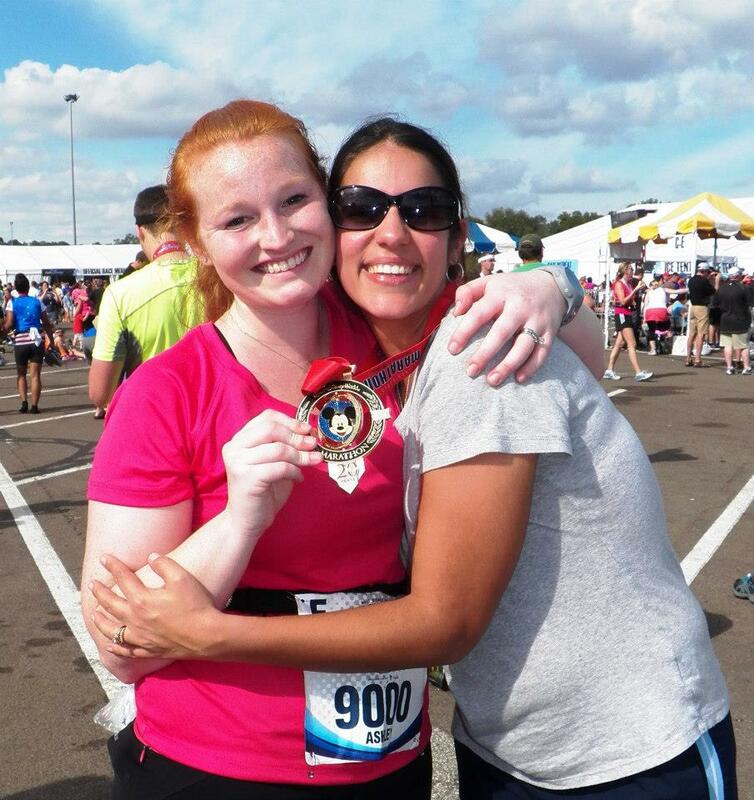 She gave me the training plan and has constantly been answering my newbie questions and helping me along the way. I guess it was very sentimental when she ran with me for a few minutes….because as soon as she left me I started tearing up!) The weather was actually great for the first 10 miles, but man once we left Animal Kingdom and hit that sidewalk heading to the highway it was hard! And they ran out of cups for the powerade (not sure why they didn’t just use water cups) but clearly I was dying because this guy handed me a 2 liter of powerade. I took a few sips, and then had to throw it away! If something is in my hand I drink it, and I definitely did not want to overhydrate. Miles 15-17 were terrible and all highway! Very sunny! There was a random stranger handing clementine wedges out, and yep I took one. It was great and took my mind off of the heat for a second. I knew I was getting sunburned (sorry Dad! ), but my stupid sunscreen stick sucked! I tried every 30 minutes to reapply and I don’t think it helped much. Weather stops were great, medical tents were busy! Many people were taking refuge in the tents for shade, and I didn’t blame them for a second. Many northerners came down for this race, and had never experienced humidity like it was on Sunday. 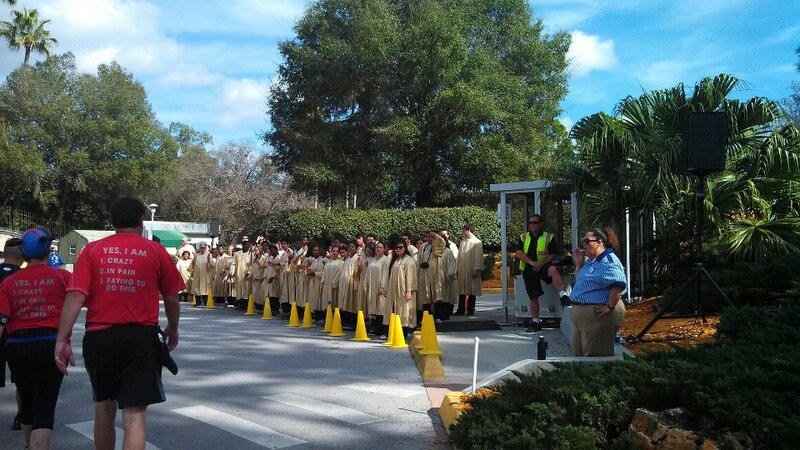 I saw my husband passing me on the way out of ESPN Wide World of Sports, right after mile 20. 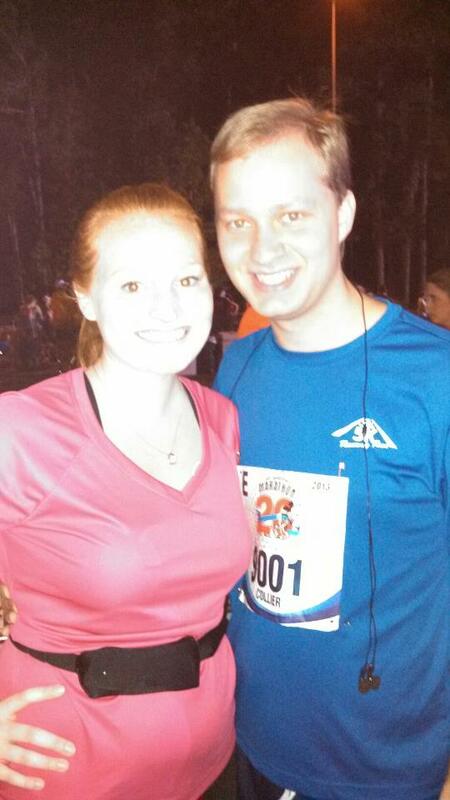 He looked so fresh and gave me a big kiss…..definitely what I needed to finish the last 9 miles! We headed into ESPN, let me tell you, it was terrible!!!! We ran around almost ALL of the tracks! Baseball, soccer, track, blah blah blah. And there were even high school teams practicing. Jeez, way to feel good about yourself when a bunch of in shape 15 year olds are doing sprints. We finally ran through the 20 mile celebration. What a let down. We were told there would be a huge celebration. Not much going on at all! Some weird balloon characters, and that was it. It gave me chills! I started sprinting towards the finish line….but noticed on my garmin this marked my first marathon! Because of all of the weaving, I guess I ran about .2 more. I had a little victory dance in my head, but kept on going. As soon as we hit the stretch to the finish line, I started scoping the crowd to see familiar faces! I saw Chris and Allison! They surprised us! I was so confused, but so excited to see them. They ran their first marathon last April, and I truly believe people don’t understand training for a marathon until you have gone through it. It’s completely different from training for a half marathon, sprint triathlon, etc. They have supported us from the beginning and reassured us that we were not crazy and that we can do it! I saw my best friend Stacie from growing up …..and then I saw her again. I guess she was running with me:) And then I got to the finish line. A group I used to be in throughout college always was in charge of giving out the medals, so I knew I had to look for my advisor. And I found her! She gave me my medal!! And then my husband popped in out of nowhere. (I guess he was hanging around the finish line, waiting for me). 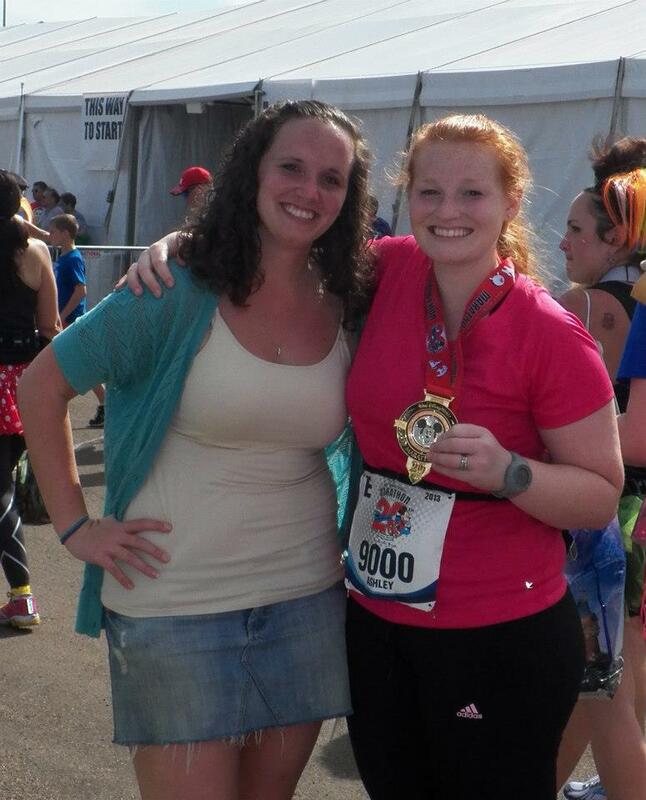 Such a full circle moment….from volunteering at the Marathon in 2009, to running it! And then it was all celebration! I learned a lot from my first marathon, and I cursed the distance and my shoes, and my pale skin and everything throughout the race. But not going to lie, woke up the next day and started thinking about doing the goofy next year??? I will do another post on what I learned, because this was clearly a very long post! We enjoyed it, and definitely think we picked a great race to be our first! We are very happy with not having any injuries either:) I guess when you train correctly, your body appreciates you! All our dreams can come true if we have the courage to pursue them. I only hope we don’t lose sight of one thing… it was all started by a mouse. Amazing job!!! 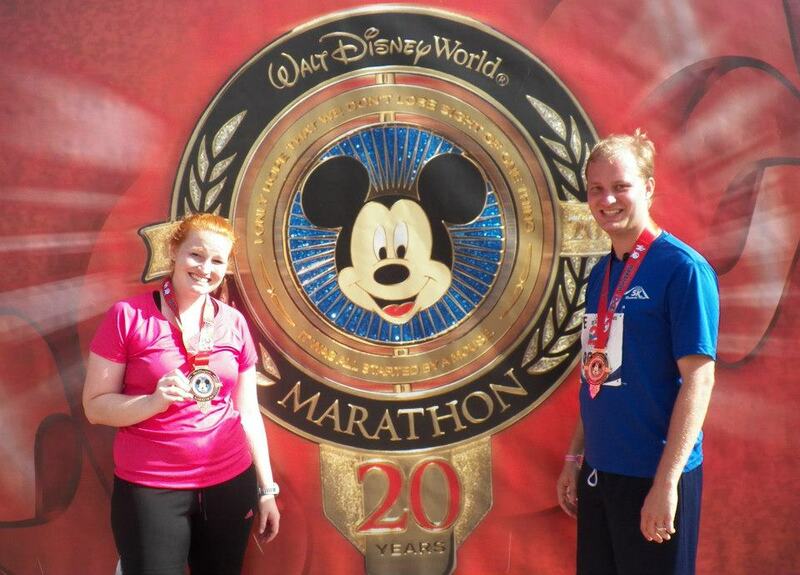 I ran my first half marathon with Disney and it was amazing. 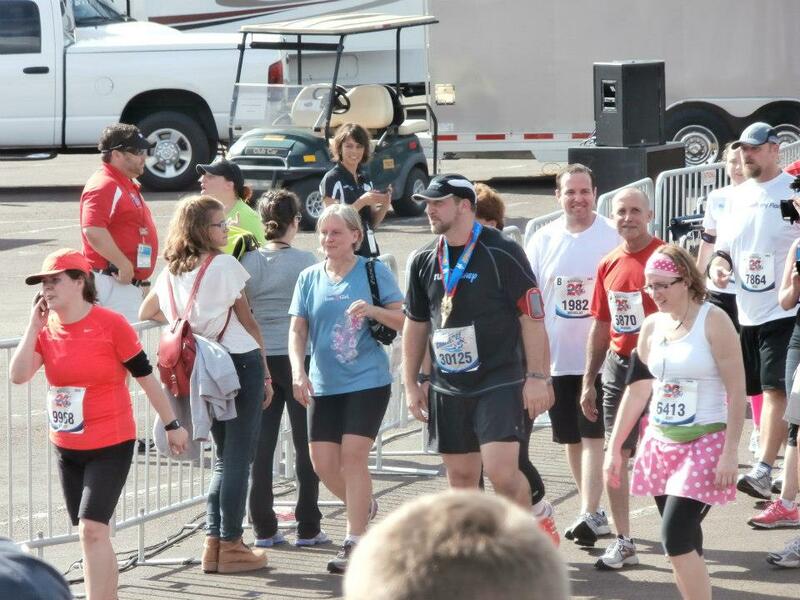 My first half marathon was the Wine and Dine in 2011! Great first race for a new distance! Great recap! Congrats on 26.2! You’re absolutely right, you could never explain the marathon unless someone has gone through it.